Milquetoast—a weak, ineffectual or bland person, derived from the character Caspar Milquetoast from the 1924 comic strip The Timid Soul. On April 8, 2008, I wrote a post entitled, General Milquetoast & Tweedledum. General Milquetoast was Gen. David Petraeus, and Tweedledum was his boss, George Bush. At the time, I decided not to publish the post because it seemed a bit too personal—maybe even a bit mean. In light of recent events, however, it seems that I was spot-on about Petraeus. For the second time the nation was treated to testimony before Congress on Iraq from Gen. David Petraeus and Ambassador Ryan C. Crocker. Petraeus, a bookish man, a helpless looking individual sunk into what appears an ill-fitting uniform again contributed non-informative answers to the cause—Casper Milquetoast personified. Gen. Petraeus’ partner, the buttoned-down Ambassador Crocker provided a low-key and colorless backup to Petraeus’ remarks—playing Tweedledee to Petraeus’ General Milquetoast. Gen. Milquetoast and Tweedledee were careful to stay on point with their leader, President Bush, Tweedledum, as it were. The body language of these two insipid individuals, Petraeus and Crocker, was revealing. When one spoke the other turned to watch, hanging on every word, apparently to make sure their partner was on target—the target being conformity with the Bush campaign to stay the course. 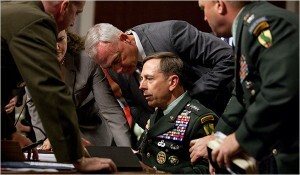 Now, an interesting study by UCLA shows that Gen. Petraeus was wrong and Gen. Jones was right. 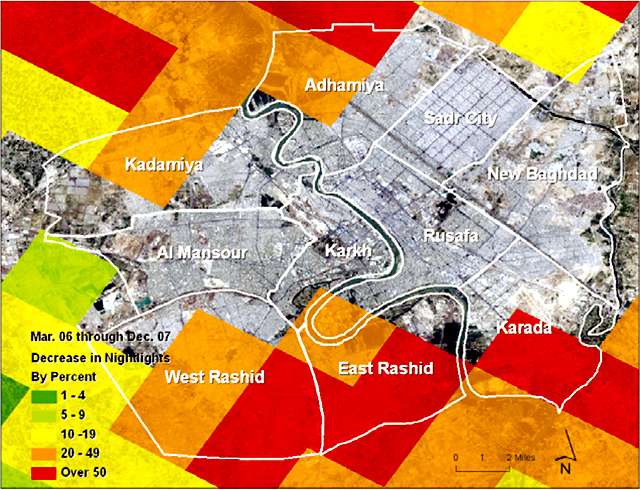 By tracking the amount of light emitted by Baghdad neighborhoods at night, from publicly available satellite imagery, UCLA geographers have uncovered evidence supports the findings of Gen. Jones. Night light in neighborhoods populated primarily by minority Sunni residents declined dramatically just before the February 2007 surge and never returned—evidence that ——ethnic cleansing by Shiites is the reason for the decrease in violence rather than the “surge,” for which Petraeus has claimed credit. Baghdad’s decreases were centered in the southwestern Sunni strongholds of East Rashid and West Rashid, where the light signature dropped 57 percent and 80 percent, respectively, during the same period. By contrast, the night-light signature in the notoriously impoverished, Shiite-dominated Sadr City remained constant, as it did in the Green Zone. Light actually increased in Shiite-dominated New Baghdad, the researchers found. “The U.S. military was sealing off neighborhoods that were no longer really active ribbons of violence, largely because the Shiites were victorious in killing large numbers of Sunnis or driving them out of the city all together,” Agnew said. Back in 2008, I was right about Petraeus—the supposed expert tactician, the video-game General, the Corporate Man, the timid soul who sinks into his bemedaled uniform, the General who faints at a congressional hearing—General Milquetoast.